Spring will turn to summer in June, which means gardens will be flourishing in some parts of the country or starting to take off in other parts. Gardening is much more than a hobby; it can actually improve our lives. Here are a few ways garden has been shown to help us with everything from mood to our relationships. First, gardening is a form of exercise. The Centers for Disease Control and Prevention shows that gardening can burn up to 330 calories in an hour of light gardening or yard work. This is more calories burned than lifting weights at the gym for the same amount of time. Gardening yields health foods. Unless you’re out there planting cupcakes in hopes for a three-layer decadent cake later this year, gardens are where we get our vegetables. And if you sneak in more vegetables in your diet, you can improve your nutrient intake and live healthier. 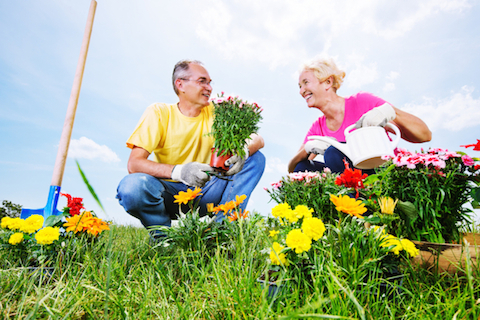 Gardening can even improve relationships, says a study from the Medical University of Vienna. Researchers say that digging, weeding, and mowing the lawn for half an hour improves men’s performance in bed by more than a third. Researchers add that a half hour of cycling and dancing does the same, FYI. Basically, any regular activity that burns 1,000 calories a week helps with erectile function. More gardening means better immunity. When you are outside in the sun you soak up vitamin D, which helps the body better absorb calcium. More calcium improves not only bone health, but also improves immune system health. Looking for a way to lower your blood pressure? Grab a shovel. 30 minutes of moderate-level exercise a few times a week helps control high blood pressure. Gardening, specifically, was recommended as a top choice for reducing blood pressure by the National Heart, Lung, and Blood Institute. Do you know what else is good for your health? Doing what makes you happy, and gardening has been shown to make people happy. A study from Evolutionary Psychology showed that when people saw flowers, they smile, and smiling improves one’s mood. Though you can’t always eat flowers, you should probably plant some in your garden. So if you want to boost your diet, put a glove on that green thumb and get outside to grow a garden. Tell us, what’s your favorite thing to plant?